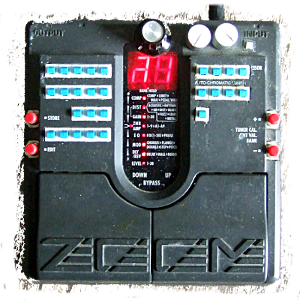 Whenever guitarists spot this one in my stage setup, they get all misty-eyed telling me how the Zoom 505 used to be their first multi effect, before admiting to having sold it shortly afterwards, realising how awful it actually sounds. If I was playing guitar, I'd probably do the same. In fact, I did. The Zoom 505 was my first multi effect, too. I bought one when I was starting to make silly sounds with random toy keyboards about 2 years before I even learned about circuit bending. I must say I wasn't too impressed with it either, but I think I mainly sold it back then because it sucked batteries dead in about 5 minutes and I found the buttons to be too unresponsive. Or it stopped working or something. Due to it's relatively bad reputation, however deserved it may be or not, and the fact that it already was a buget pedal to begin with, it can be obtained for very little money. The nice thing about cheap stuff is that it doesn't hurt as badly when you accidentally permabend (read: break) them. Which is always a danger you're facing when trying out new gear even as a seasoned circuit bender. The occurrence of frying things can be somewhat minimised by using proper soldering equipment and a general knowlewdge which areas to avoid when poking around, but it will still happen. I've worked with multi effects before, such as the Yamaha EMT-100 or the Casio VA-10's inbuilt effects section, but as I am usually touring out of one suitcase, I was looking for an equally powerful substitute which is light and small, but still has enough space for switches on its front, so I don't have to resort to breakout boxes. It came as a plus that I already was familiar with the process of editing effects patches. I modified my first 505 the one in the picture above) around 2009 and have taken it to nearly every single concert I've played since then. It is just so incredibly versatile, both as an effects unit and as an instrument in its own right. 1 instant loop switch. Keeps whatever is present in memory and repeats it as a slightly wonky loop. The loop stays until the switch is released or power is disconnected. 15 switch matrix for tone/and rythmic variations. Works on incoming signals and with loops. 8 switch matrix for distorsions/noise. From barely noticable to the nastiest crunch (goes LOUD). Distorts/fattens loops, produces noise when no loop is running. Coarse/fine pitch control covering a wide range, so the effects and loops can be tuned musically. 1 pot connected to the expression pedal output. Several patch parameters can be routed to this pot. Effects patches still work in the same way as before. Also, when changing into edit mode while playing, effect parameters can be influenced for example while a loop is playing. Update: I've had a few requests for more infos on the bends I built in this one. While I am happy to share my knowledge, most of it really came through poking around in gear and figuring out stuff by myself. I don't want to sound like a dickhead but I think putting out the whole plan can be a bit counterproductive as I sometimes feel it gets people to do circuit bending like building IKEA furniture. Which I consider a bit lame for a thing that's based on experimentation and discovery. Well, Ok, I guess I do sound like a dickhead. I kind of thought the same of Reed Ghazala's nebulous descriptions about how he built his gear when I first read them. And I am well aware of having had generous help through the years. so I guess I'm gonna do a compromise in giving you everything to learn all this stuff for yourself. Here's a video of a ZOOM SOS I built for my dear friend Inox Kapell. I built it quite a bit later than the original one and it turned out even better than the original unit. I'm building in a ribbon controller. This is gonna be effing awesome! More soooon.